Lake Forest, IL – September 18, 2015: On the first day of play at the 2015 BMW Championship, Jordan Spieth recorded a hole-in-one, resulting in the donation of another BMW Hole-In-One Scholarship, a full, four-year Evans Scholarship worth $100,000. Spieth aced the 2nd hole, his 11th hole of the day, on Wednesday, September 17 at Conway Farms Golf Club in Lake Forest, IL, with a 7-iron, from 184 yards. All net proceeds from the BMW Championship benefit the Evans Scholars Foundation, which provides full college scholarships to hardworking, young caddies with financial need and strong academic records. 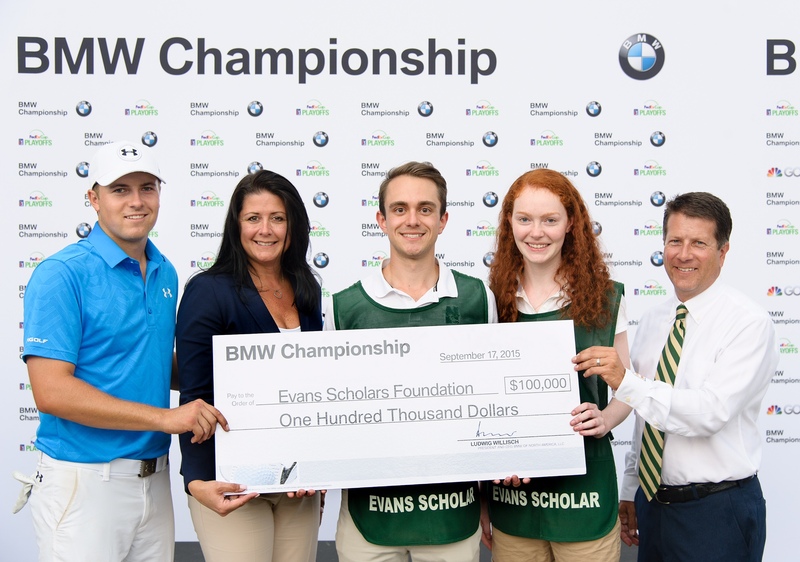 Since becoming title sponsor in 2007, BMW has contributed more than $19 million to the Evans Scholars Foundation. Yesterday’s hole-in-one marks the fourth time in the last five years that BMW has awarded a BMW Hole-in-One Scholarship. Tyler Mount and Rose McBride, Evans Scholars at Northwestern University, accepted the donation on behalf of the Evans Scholars Foundation. Later this year, BMW and the Western Golf Association (WGA), sponsor of the Evans Scholars Foundation, will jointly select and award the 2015 BMW Hole-in-One Scholarship in Spieth’s name to a student caddie who will attend college next fall. “This additional contribution of the BMW Hole-in-One Scholarship is greatly appreciated, and we congratulate Jordan for making it possible, and we thank BMW for its ongoing commitment to the Evans Scholars, which allows young caddies the opportunity to change the course of their lives,” said WGA President and CEO John Kaczkowski. This entry was posted in Golf Tournaments by Golf Now! Chicago Blog. Bookmark the permalink.